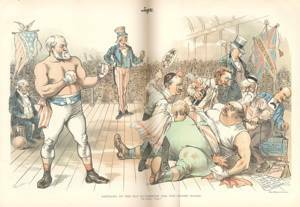 This cartoon uses a traditional motif by depicting the 1892 presidential election as a boxing match between the two parties’ nominees, Republican Benjamin Harrison (left) and Democrat Grover Cleveland (right). However, the title’s reference to “Ex-Champion” and “Second Round” indicate what was unique about the campaign: it was the only election in American history to pit two men who had already been president against each other. As the incumbent, Harrison had served since March 1889, while Cleveland’s first term had extended from March 1885 to the beginning of his Republican rival’s inauguration. Other former presidents in American history ran for a non-sequential term—Martin Van Buren in 1848, Millard Fillmore in 1856, and Theodore Roosevelt in 1912—but they were nominated by third parties and their opponents had never held the presidential office.